A delicious addition to your meals – or taken as supplement – my brand of pure Golden Nutritional Yeast Flakes (GNYF) is extremely beneficial in terms of nutrition. Also called ‘nooch’, this is an inactive yeast which is highly beneficial to gut flora, and it’s pretty yummy too. It is cultured on beet molasses and sugarcane fibre but there is no sugar present. With a net carb count of just 6g per 100g, 2 tablespoons will then provide less than 1g carbs. It is not like regular yeast and won’t cause yeast infections – and it cannot make bread rise. GNYF is an inactive yeast, so cannot be used for baking. The taste of GNYF is savoury, nutty, cheesy and often used in vegan dishes in place of cheese. I use it as an additive in white sauce to emulate cheese as I’m intolerant to dairy. I also like to use in a gravies and stews if I don’t have enough of a savoury taste present. If you’ve never thought of trying GNYF, you might find it’s your new favourite kitchen ingredient! Inexpensive and with a long shelf life, it’s a handy addition to your yum-adding arsenal. I have sourced a very high-quality nutritional yeast flake (they vary in quality) which I just love, so thought I’d share it with you. 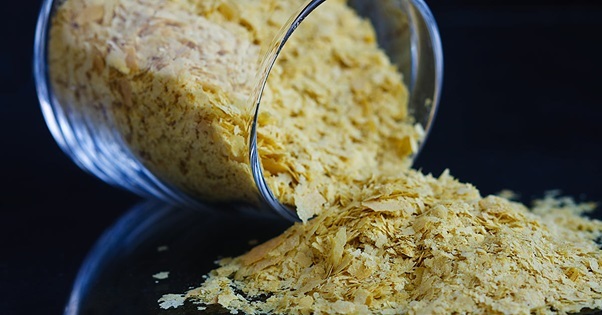 A high-quality nutritional yeast flake is not always that easy to find so my only alternative was to bring in a fabulous quality one, and then share it with others to ‘support my habit’. Again, as with many of my quality products – it is ONE simple ingredient, I don’t add anything to it, but it’s truly packed with nutrition. You’ll find them in my online store! A true superfood – and tasty too!